Upper West Side, NY (October 10, 2018) – According to fire officials, an apartment fire broke out on the Upper West Side, resulting in the injuries of five people on Wednesday, October 10. The blaze was reported to have taken place in the early morning hours, at around 5:00 a.m. on the 6th floor of 830 Columbus Avenue. 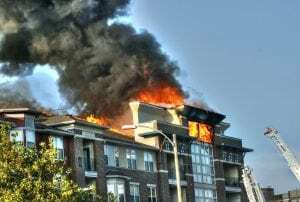 Firefighters were quickly called to the scene to battle the flames that were seen engulfing the top half of the nine-story building. Fire trucks immediately surrounded the block in an attempt to get the fire under control. Emergency medical crews were called in to assist five people who were reported to have suffered at least minor injuries during the incident. However, it was not specified as to whether or not any of the injured civilians had required hospitalization following the blaze. No further information has been released at this time, and authorities are currently conducting an investigation to determine the cause of the fire. First and foremost, we would like to offer our sincerest wishes to the injured parties as we maintain hope for their full recovery. We also wish to thank our local firefighters for extinguishing the flames. All fires and explosions in New York have the possibility to be extremely deadly. It is crucial to understand that you may have the right to be compensated for your injuries in the event that you have been hurt in a New York fire, especially if the incident is due to someone else’s negligence. At Hach & Rose, our concerned New York accident lawyers are devoted to serving those affected by the carelessness of other people. If you have been injured in a New York fire or explosion, please don’t hesitate to call 212-779-0057 and let us put our experience to work for you today.